If you want to step into the shoes of villagers who lived a few centuries ago, then the Estonian Open Air Museum (Eesti Vabaohumuuseum) is the place for you! It is a perfect family-oriented site where you can escape from the usual city-life and have a picnic with your friends and family members. The Estonian Open Air Museum is located in the quiet seaside area of Rocca al Mare. It was founded in 1957 and has at least 72 constructions on its site which are divided into 12 farms. The site is quite big, 79 hectares to be exact. By visiting this fantastic place you can experience life as it was a few centuries ago. There you can find some typical village buildings: a school house, a fire station, a shop, a church, a tavern, some mills, and fishing sheds by the sea. One can enter the houses and feel himself/herself sinking into the atmosphere of those times. Not only you can see the houses on the inside, but you can also take a look at their inhabitants trade and belongings. These constructions are a spectacular example of how people of different social statuses used to live back in the 18th, 19th, and 20th centuries. The staff are dressed in special costumes helps you to sink into the atmosphere even deeper as they demonstrate how people lived and worked in the past. This absolutely awesome place is available all year-round. You can buy handicrafts, ride horses, visit family-oriented theme fairs, and even try traditional Estonian dishes at the tavern. 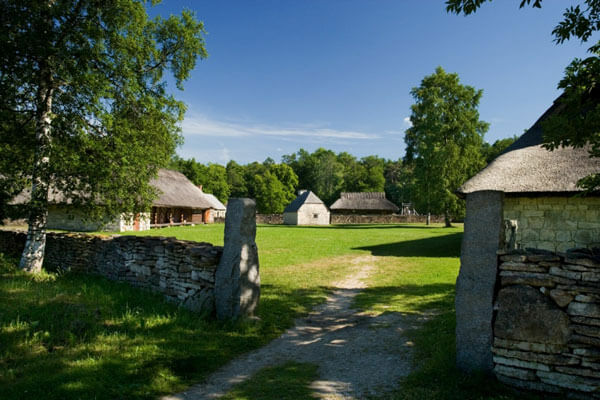 If you are planning to visit Estonia, be sure to visit the Open Air Museum and see rural Estonia with your own eyes.